This soup is jam-packed with brain healthy ingredients, starting with its broccoli base. Broccoli is part of the powerful cruciferous clan. According to The MIND Diet, crucifers such as broccoli and cauliflower are winners for cognitive performance. Eating half a cup a day of broccoli can shave two years off your cognitive life! Thus, there's a brain health boost in eating at least one serving a day of cruciferous veggies (i.e. broccoli, cauliflower, kale, Brussels sprouts)—you can get vitamin C, folate, fiber, and potassium. Additionally, fresh ginger root offers natural anti-inflammatory benefits, as well as aiding in good digestion and feeding the friendly bacteria in your gut. This all bodes well for brain health because when you keep inflammation down and your gut happy, your mental health benefits, too. In a steamer pot, add water and broccoli to the colander. Over high heat, bring to a boil and steam broccoli for a few minutes until bright green. Be sure not to overcook until broccoli is mushy. Instead, you can microwave the broccoli—no water needed—for one to two minutes to steam it. Place the cooked broccoli in a food processor or blender. Add a cup of the cooking water, reserving the rest for later. If you microwaved it, add plain water. Pulse for a minute to begin to puree. Add the ginger, Sriracha, garlic powder, salt, and cheese. Pulse a few more minutes. If consistency is too thick, add the remaining half cup of water. For a creamier consistency, stir in milk. This soup is very versatile. You can add another vegetable with broccoli, such as red peppers, carrots, or mushrooms, and puree it in. Up the protein with silken tofu or even a hint of ricotta cheese. At the end, you can toss in a handful of white Northern beans or chickpeas for additional texture, protein, and fiber. Flavor up your bowl with smoked paprika or curry powder for a more ethnic flavor. Instead of Parmesan cheese, sprinkle in nutritional yeast for a vegan hint of cheesy flavor, plus protein and B12! By steaming the broccoli first, it breaks down the cellulose a bit, making it easier to puree. 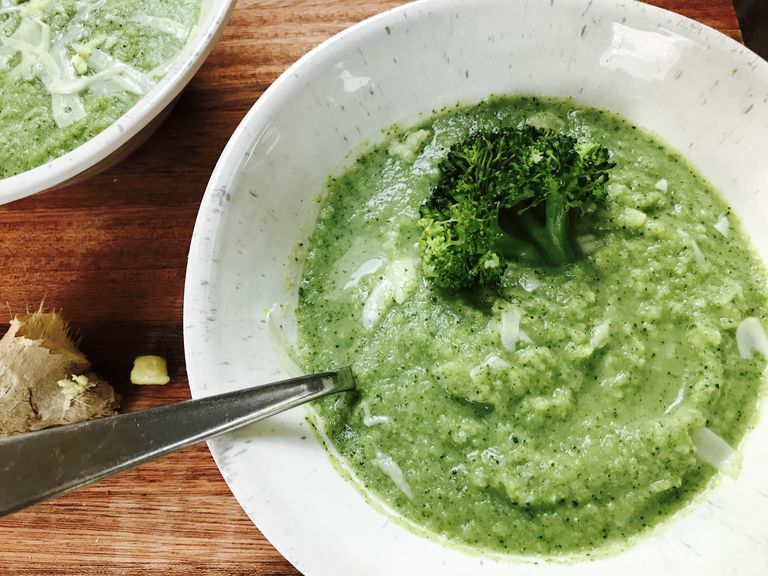 If you have a Vitamix or another blender than heats soups as they puree, feel free to throw the broccoli in raw. This soup can be served warm or cold, whatever is preferred. Serve with grilled fish, chicken breast, or tofu.